Ilya Kaler is a Russian violinist and teacher born (in Moscow) on June 2, 1963 (Anne-Sophie Mutter was born 27 days later that same year and Heifetz was already 62 years old and would live an additional 24 years.) He is known for his unique achievement of winning three major violin competitions, namely the Paganini (1981), the Sibelius (1985), and the Tchaikovsky (1986) competitions, the only one to do so – so far. At the Central Music School in Moscow he studied with Zinaida Gilels (Anastasia Khitruk and Stefan Jackiw also studied with her. She is Elizabeth Gilels' niece.) 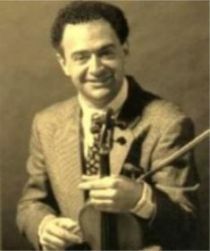 He later studied with Leonid Kogan and Victor Tretyakov at the Moscow Conservatory, and with Abram Shtern privately (in Kiev, Russia and Los Angeles, U.S.A.) Kaler has been praised (by The Washington Post) as being “a consummate musician, in total control at all times, with a peerless mastery of his violin.” His recordings of the Paganini Caprices have been described (by American Record Guide) as being “in a class by themselves – combining the perfection, passion, and phrase sculpting of Michael Rabin with the energy, excitement, and immediacy of Jascha Heifetz.” Kaler has performed with the Moscow, Leningrad, and Dresden Philharmonics; and the Montreal, Seattle, Detroit, Baltimore, Danish, and Berlin Radio Symphony Orchestras among many others. (For reasons known only to those immediately involved, Kaler has never soloed with the orchestras of New York, Boston, Cleveland, Chicago, Los Angeles, or Philadelphia. He has also never appeared with the top orchestras of London, Berlin, Amsterdam, Vienna, or Paris. It is an odd and freakish thing that while the concertmasters of these orchestras – none of whom achieves his level of artistry - get to solo with these prestigious ensembles, a phenomenal player like Kaler does not. It could be the Eugene Fodor phenomenon at work – blacklisting – but who really knows? - there may be other factors at play about which I know nothing.) From 1996 to 2001, Kaler was concertmaster of the Rochester Philharmonic. He has toured with a group called the World Orchestra for Peace, an ensemble led by Valery Gergiev – I had not heard of this orchestra until just now. Kaler has also toured Russia, Europe, the U.S., South America, and Asia, as a recitalist and as a soloist. With Amit Peled (cello) and Alon Goldstein (piano), he recently formed the Tempest Trio. The trio has received enthusiastic reviews and has been compared to the legendary Heifetz-Piatigorsky-Rubinstein trio. Kaler has taught at the Eastman School of Music (Rochester, New York) from 1998 until 2001, Indiana University (Bloomington, Indiana), and (currently) DePaul University (Chicago, Illinois, U.S.A.). As do almost all concert violinists nowadays, Kaler performs frequently at far-flung music festivals in the U.S. and abroad. His recordings include the concertos of Paganini, Brahms, Dvorak, Glazunov, Schumann, Tchaikovsky, and Shostakovich. They are very easy to find on the internet. He has recorded for the Naxos, Melodya, and MCI labels. YouTube has several videos of his playing, one of which is this Slavonic Dance by Dvorak. Kaler has played and recorded with the Sennhauser Guarnerius del Gesu (1735 – from the Stradivari Society.) He has also played and recorded with more modern Joseph Curtin violins (1998, 2003, and 2010.) Ilya Kaler is married to a concert violinist (Olga Kaler), as is Gil Shaham (Adele Anthony), Albert Markov (Marina Markov), and as were also Leonid Kogan (Elizabeth Gilels), and Richard Burgin (Ruth Posselt.) Among Kaler's pupils are Sean Bradley and Daniel Kurganov.